In spite of the fact that the U.S. Department of Agriculture has said that school lunches will now be healthier, they’re still purchasing nasty pink slime and feeding it to kids, at least according to The Daily. Pink slime meat, often called Lean Beef Trimmings (which sounds a whole lot better) is ground-up beef scraps, cow connective tissues and other icky beef trimmings, treated with ammonium hydroxide, then blended into delicious meat by-products such as burger patties, placed on a bun and served to kids. Keep in mind that ammonium hydroxide is a material used in bombs and cleaning products. Although rejected by fast food chains for years, and turned into a public health issue by Jamie Oliver’s Food Revolution, the USDA deems it good enough for your kids. Note to self: send a packed lunch to school right!? Think this is a new cost saving development? Think again. Two years ago, a USA TODAY investigation revealed the same USDA purchasing decisions. School lunches were bad years ago and they’re still gross now. Until the USDA gets their act in gear, consider sending your child to school with a healthy packed lunch. I'm also concerned that every kid at that table has TruMoo instead of regular milk. http://beefisbeef.com/2012/03/15/top-7-myths-of-pink-slime All this misinformation is costing a lot of people their good jobs. In spite of the fact that the�U.S. 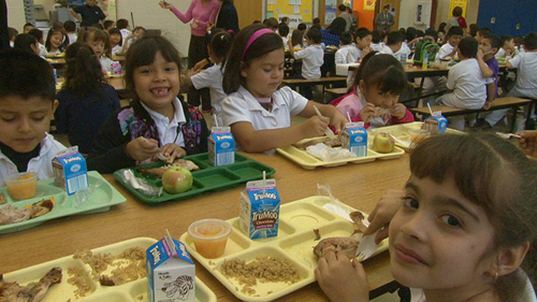 Department of Agriculture has said that school lunches will now be healthier, they're still purchasing nasty pink slime and feeding it to kids, at least according to The Daily. Pink slime meat, often called Lean Beef Trimmings (which sounds a whole lot better) is ground-up beef scraps, cow connective tissues and other icky beef trimmings, treated with ammonium hydroxide, then�blended�into delicious meat by-products such as burger patties, placed on a bun and served to kids. Keep in mind that ammonium hydroxide is a material used in bombs and cleaning products. Although rejected by fast food chains for years, and turned into a public health�issue�by Jamie Oliver's Food Revolution, the USDA deems it good enough for your kids. Note to self: send a packed lunch to school right! ?